I’ve deemed my floor cloth finished…for now. I ended up not putting a binding on the edges because I realized that any type of fabric on the edges (I was planning on using quilt binding) would make it difficult to sweep the floor cloth. Right now without the binding, I can sweep things right off of the floor cloth with ease. With the binding, I’m afraid that dirt and junk would get caught up underneath the fabric. Definitely not a good thing. I went with the majority on this one, and most of you said to keep it this size. I tend to agree. I think that proportion is important in decorating, but there are times when rules can be broken…like putting an extra large chandelier over a small breakfast table for dramatic impact, and putting a really big and colorful floor cloth in a tiny kitchen. I love it! Here are the steps that I took to make my floor cloth. First, I started with a remnant of vinyl flooring purchased from Home Depot. The piece was way larger than I needed, so I used a utility knife and L-square to cut the vinyl to the correct size. I ended up with a 3’ X 6’ piece. I placed the vinyl on a drop cloth with the decorative side down, and the back side of the vinyl facing up. I then rolled on one coat of latex Kilz primer. I found this to be VERY frustrating. This primer never dried to a completely dry finish. I waited several days between priming and painting (not for any reason other than I was working on this when I had time between other projects), and even several days later, the primer still had a tacky feeling to it. Dirt, dust, animal fur…everything would get stuck to it. As I was trying to mark my lines for the stripes, my hands would stick to it, and the oils from my hands would leave marks on it. It was incredibly frustrating, but once the paint was on and dry, that tackiness went away. So if you experience the same thing, just know that it’ll all work out in the end. Mine did! Once the primer was dry, I used my L-square and a pencil to mark off lines at random intervals for the stripes. I knew I wanted to start with the green-blue color, and I wanted about six stripes in that color. So using absolutely no rhyme or reason, I marked off six stripes of varying widths. Using those lines, I applied painters tape to mark off the stripes. (See those dark blemishes? That’s where I put my knee or hand on the primer and it left those marks. Really irritating!!) The arrows point to the six stripes marked off with painters tape. Then I painted those stripes, removed the painters tape, and let the paint dry. Once it was dry, I was ready to move on to the next color. I did each color the same way…marking completely random stripes of varying widths. I went back and did several very thin stripes over the big stripes. I also used a small artist brush to fix any areas where paint had bled under the painters tape. When everything was dry, I moved on to the next step…whitewashing. I then used a paper towel to apply the paint mixture over the entire surface of the floor cloth using small circular motions. You can see in the photo below, especially on the blue stripe, the difference that the whitewashing made. Move your cursor back and forth over the photo below to see the difference that the whitewashing made. When the whitewash was completely dry, I sealed the floor cloth using three coats of non-yellowing lacquer. The lacquer was VERY shiny. In fact, it looked almost as shiny when it was dry as it did when it was wet. This is the dry floor cloth with three coats of lacquer on it. Since I didn’t exactly want a super shiny floor cloth, I followed up with two coats of clear matte spray finish. And once it was dry, it was just as I had imagined it! Not too dull, and not too shiny. And the finished floor cloth (I think). I’m not sure why, but I still feel like it needs some sort of border, and if it can’t be fabric (quilt binding), then perhaps paint. Hmmm…or maybe I should just leave it alone. Who knows what I’ll end up doing, but for now I’m crossing this project off of my “to do” list!! I love it, and the very same orange/blue scheme I'm doing in my son's room! That is great- I have been frustrated with my kitchen floor- I need a large rug, but I can't imagine the daily cleaning I would need to do to keep it looking nice, much less finding something in the size I need, pattern I like and price I am willing to pay- I may need to consider this option. Loved it ! I know that feeling ' something's off' . I too keep changing things until I feel its perfect. I am so glad you decided to keep the size! Especially now that I have seen all the hard work you put into it. Thanks so much for the tutorial. I just might make one of these one day. I love it just the way it is! I wouldn't put a border of any kind on it, but definitely not fabric. Not only would it be harder to sweep, but it would get dirty and need much more care than the floorcloth itself. I think it is finished! Outstanding, I love the color scheme! You do fantastic work, I would swear that was store bought! Lovely floor mat, brilliant choice of colors. Thank you for sharing. Have you thought about cutting the edges so that they're not straight? Like a decorative fancy kind of cut? It might give a bound look without the binding… But then again, I read your blog because I consider myself decoratively challenged 🙂 I'm a new homeowner so thanks for all the decorative and budget-friendly inspiration! Another option for binding is duct tape in a pretty color 🙂 Last time I was in the U.S. I picked up some lovely turquoise duct tape for craft projects. You can miter cut the corners, too. It looks awesome! The colors are amazing. I love your blog! Gorgeous photos and so many inspiring ideas! That came out wonderful! Did all the lacquer make it stiff? How does it feel to walk on? Anne, it's actually not stiff at all. And walking on it is just like walking on any vinyl floor. It's quite nice! I think it looks great as is. Great job! You've done an amazing job, it looks fantastic! Hard work, but it's definitely paid off, I wouldn't add anything else to it, looks finished as is! I can't tell you how inspiring and encouraging this is! 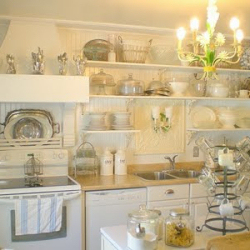 We have a TINY kitchen with awful linoleum, horrid laminate cabinet and counter tops. I'm looking at painting the cabinets and counter tops and making a large floor cloth like this may allow me to not have to replace the floor just yet! Oh, a question: How will you clean this? Thanks! Lauren, I've found that just sweeping it every day keeps it pretty clean. But when it needs it, I'll probably just spot clean it with a mild spray cleaner or soap and water. Perhaps every few months, I can take it outside and give it a more thorough cleaning, if it needs it. I just stumbled across you blog and I LOVE your posts. I've already bookmarked it! I'm going to be doing some of your projects soon. I'm super excited. Thank You for the inspiration!!! I found your post on the HoH hook-up and just wanted to tell you I love your painted floor cloth. I think I may have to do that under my kitchen table. I've always wanted the look of a rug there, but could never justify the mess under the eating area! Found you on FJ's SNS. I love this project! I just added it to my to do list! Thanks for the tutorial! I know this is a silly question, but how does it stay in one place? Doesn't it slide around and move? Absolutely LOVE the finished product!!! Kimberly, that's not a silly question at all!! Mine doesn't move or slide simply because I have such a tiny kitchen, and I have to walk around a corner to get into the kitchen, so I'm never walking in with lots of momentum. lol…Does that make sense? But definitely, if I had a larger kitchen with a straight shot access, I would want to do something to make it less likely to slide. I thought through some different options. First, I think there are some temporary adhesive tapes that could be used on each corner. If that didn't work, you could also use a regular rug gripper pad thingy, cut it to fit the size of the floor cloth, and then permanently adhere it to the back. Anyway, that's definitely something to think about for larger kitchens!! Very cool! I definitely want to make one of these! I swear, you come up with THEE best stuff! Not only that, but your tutorials ROCK! Thanks so much for sharing this. I'm sure I could use a painted rug somewhere in my house! Nice project! I never thought that I could do it on my own. Well done! Looks spectacular. I've done floor cloths in the past using the back side of lino. I currently have some remnants left from a tiling job and am considering making another. Thanks for inspiring me. I love this! I would love to have you come share this on a special guest post at Remodelaholic. Let me know if you are interested and I will send you the details! Your color choices flow so well! I used this as a feature on my DIY rug roundup post at http://sheekgeek.org/2011/jessicasheekgeek/diy-home-rug-roundup. I can't wait to make a rug like this myself ;0)! Very nice and great tutorial too. I linked this to my rugs post as well – come on over and take a peek! I really like it. The colors are very summery! I have been wanting to do this for a long time. I love it the way it is, I would leave it alone. I have to get to this project. I have just so many things that I want to do. 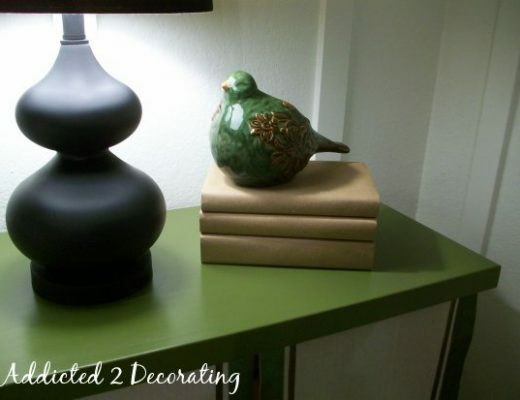 Love it, and the paint color you used on the cabinets! Thanks for the tip on the primer. that can provide decent wooden flooring in our budget. wow, whoda thunk it? Very clever & looks GREAT! What kind of paint did you use? I am wanting to paint some vinyl boots with a small decoration. Do you have any suggestions? I used latex paint for this, and then top coated it with clear non-yellowing polyurethane. I have no idea if that would work on boots, though. I would think that oil-based paint would stay on better–perhaps even paint pens (do they still make those?) or tubes of artist oil-based paint. Ive been thinking about doing this for a while. I will probably use a spray poly for the finish. This is a great tutorial, I will link your tutorial on my blog. So glad I saw this on Pinterest. This may be the perfect idea for some color on our screened porch floor. I was worried about a rug getting dirty. Thanks! Now I must go read more of your blogs……. does the ‘rug’ stay in place? does it lay flat? thx for tons of inspiration nice lady! It stays in place, and it does lie flat. Kristi, what a clever idea! You describe the whole process in simple terms and the photos are super. It would be an interesting project for families encouraging them to work together and have fun. Keep up the good work. I’m curious…what made you decide to use the Kilz latex primer, when you were going to seal the whole paint job anyway? It’s my understanding that Kilz is used to help prevent mildewing. Kilz is a primer. Any surface needs to be primed before paint for maximum adhesion. Kilz, esp the oil-based variety, can help cover stains, like mildew. I am wondering if you used the vinyl with has a paper type back or the one that is vinyl on the back. I painted a mat 10 years ago for in front of my sink and it has lasted with very little paint chipping off. I used the paper backed type. I am asking because I am wondering if the paper backed type lasts longer as mine as been great. But then I look at the vinyl backed and it is thicher so that is nice too. I used they vinyl-backed flooring. I didn’t think that the paper-backed flooring would last that long. I’m amazed! I have a question…..I am thinking about trying this as a rug under our dining table in the breakfast room. Will it hold up to “chair traffic”? how about a duct tape boarder? If you use gesso instead of the primer I dries quickly and makes a great primer. I love this! I am looking for an alternative for a rug to go in my living room. I have 2 big dogs and their doggy odors (even though I keep them bathed) gets trapped in rugs. I’m new to diy. So, this might be a silly question. But, can remnant vinyl flooring be found in bigger pieces and do you think it would be a good alternative for a living room rug? Or, do you have any suggestions? You may not be able to find a remnant, but you can just purchase vinyl flooring to make a floor cloth big enough for a living room rug. It would still be cheaper than most rugs that large. Genius! Bring on the vinyl revolution!! Could you just paint a border on? I have a roll of vinyl I want to paint, cut off what I needed but it won’t lay flat, l painted it,but it just won’t lay down help please !!! Did you try rolling it the opposite way and leaving it for a day or so? I LOVE this mat! I’d love to make one for my mud room, but it will take A LOT of dirt and traffic from two crazy dogs. Can it be mopped? I’ve just started painting one and notice that the edges of the vinyl want to curl up. Did you have that happen to you? What did you do about it? Thanks. I’m guessing that the vinyl I used was thicker, because it didn’t curl at all. Love the idea! How do you think this would hold up under a dining table with movement of chairs. Would totally like to try this if I thought it would hold up to the wear of chairs being moved often. Thank you! I’m not sure, but I’ve wanted to try it for quite some time now. I would topcoat it with something really durable, like General Finishes high performance topcoat. I made one many years ago for my dining room and it took the chair traffic very well for over 10 years! I had put 5 coats of polyurethane on it and put felt pads on the bottoms of the chair legs so that they would slide easily. 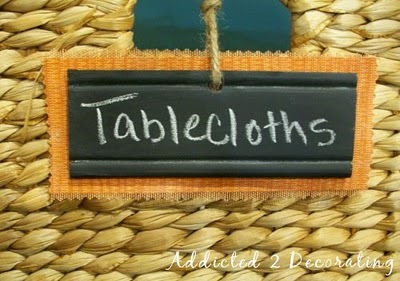 It is GREAT for a dining room because food spills just wipe right off!